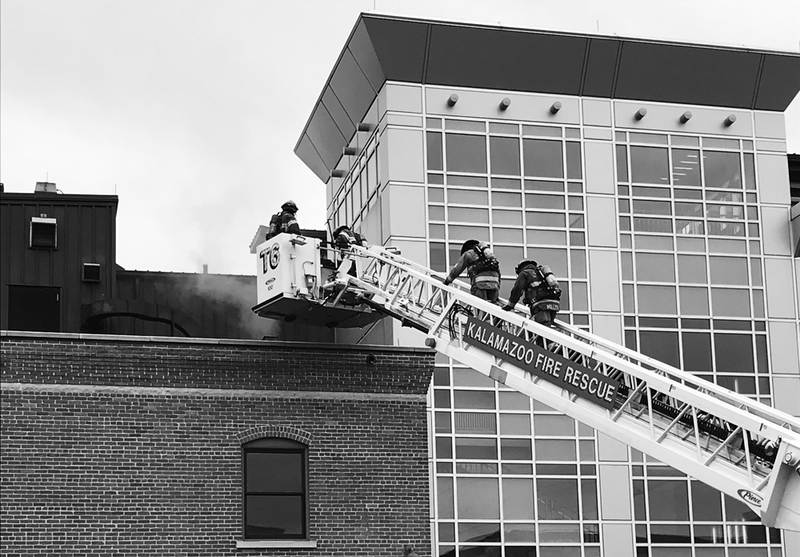 I have always known Kalamazoo to be such a warm and genuine community, and after our hood fire on Friday, September 28th, I am humbled by the outpouring of support from our community and industry partners, other local businesses, and our valued guests. From chefs reaching out regarding staffing assistance, kitchen space and taking produce our farmers grew, to a variety of downtown restaurants helping to fill our catering orders and to temporarily employ our valued staff members to ensure their solvency. We are grateful beyond words. Those of you who joined us in the parking lot the day of the fire, your presence and moral support meant the world to us. To the firefighters who helped end the blaze, we are thankful for your service. We have such an amazing staff, current and former, who have rallied to do whatever necessary to keep the energy level positive and values of Food Dance at heart while we rebuild and reopen our business. This community simply amazes me. I would like to extend a special thank you to our landlords, Patti Owens, and the Catalyst team. Without their swift response, ambition and generosity we might not be able to reopen. I have no words that could summarize my gratitude. As we sit with empty coolers, no food on our shelves we are a bit lost. In this industry and at Food Dance, we thrive on human connections; with our farmers, with our guests, with each other. We are missing the simple things - the hustle of servers moving about the restaurant, the cheerful laughter of guest voices during happy hour, the sizzle of our grill, the smell of our fresh baked bread, the calls from the kitchen “dance please”- but most of all, we are missing you. So many of you have reached out to me and to our staff, and we are very thankful for your encouragement and support. We are looking forward to reconnecting with you all again. In the coming weeks, we will rebuild better and stronger than ever. Look for us to reopen mid-November. Follow us on Facebook and Instagram to stay updated and remain a part of our story. We’ll be asking you for input that will make our reopening more meaningful - as meaningful as belonging to this Kalamazoo community is to all of us.